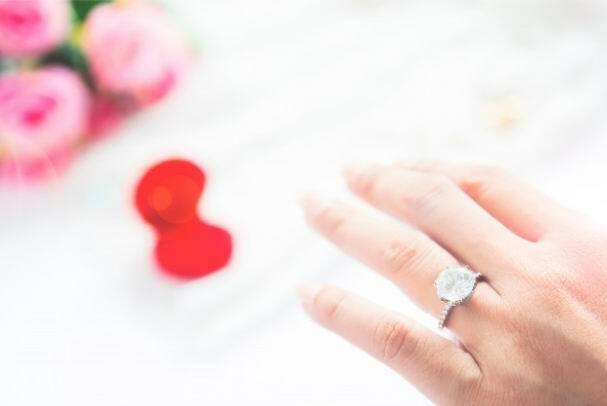 Now You Have Your Bridal Set, How Do You Wear It? You now have the two most beautiful and significant rings you will ever own. How you wear them is up to you, but there are a number of ways you can display them, some traditional, and others modern. Whichever way you wear your rings, you want them to stand out. We’ll look at a few customs and conventions, and then see how bridal sets can be worn in combination to stunning effect. Generally, the more ornate of the two rings couples mark their unions with; the engagement ring has a history going back to Roman times. It is generally worn on the ring finger of the left hand because of the ancient belief that the vena amoris or vein of love flowed through this finger. In Germany, it is transferred to the right hand after marriage. Traditionally, Turks and Poles wear engagement rings and wedding rings on the ring finger of the right hand, but this convention is becoming less frequently seen. Popular in Ireland and among the Irish overseas, a Claddagh ring, showing a crowned heart supported by two hands, should be worn with care to prevent sending out a mixed message. It means “My heart is yours; I crown it with my love”. The message is all in how it’s worn. Displayed on the right hand with the crown towards your knuckle, it shows you are unattached. Wearing it on the same finger, but the opposite way, says you have a lover, but no serious commitment yet. Worn on the left, the crown away from your fingernail, you are firmly committed (probably engaged). Finally, a Claddagh ring on your left finger with the crown towards your fingernail means you are totally committed (probably married). With a history going back to Pharaonic Egypt, the wedding ring is the most enduring symbol of a couple’s love, commitment, and union. It is often worn all day and night causing a slight indentation in the skin visible when the ring is removed. Customs vary, but in the USA and most of Western Europe, the wedding ring is worn on the right hand. It plays an important part in Christian and Jewish wedding ceremonies, and is often inscribed on its inner surface with the couple’s names, the date of their wedding, or some motto special to them. Less frequently found now that intricate modern jewellery can be easily marred in inexpert hands, couples used to have their engagement and wedding rings soldered together. Carefully selected bridal sets like diamond white gold wedding rings and engagement rings allow specially shaped and contoured rings to rest comfortably against each other letting their complementary styles catch the magpie eyes of the envious. Complementary pairings of rings allow for a multiplicity of dazzling (and highly photogenic) effects. Something to consider when wearing your bridal set is not to allow one ring to diminish the allure of the other. Generally, the engagement ring is set with a greater volume of gemstones. Because fingers taper, wearing the wedding ring below the engagement ring can cause the optical illusion that it is the lesser of the two. They are your rings, and your style is your style; whatever you do, wear them with pride.